Removed for the same reasons of the Adamson Lagoon post. The entirety of the post is posted as a comment on The Development of Rock Prairie Road. Here's a look at another major neighborhood in town: Eastgate. Unlike Northgate, Eastgate hasn't quite gotten the "student saturated" appearance. Part of this is preservation of an actual neighborhood. The definition of Eastgate is the official, city-supported version, so we'll roll with that. Here's a few things about Eastgate you should know. I covered Dominik Road a while back, so we'll go ahead and skip that. We're also going to skip the College Station City Hall and the first fire station, mostly on the basis that it's fairly well documented elsewhere (and we mentioned it here, which is where these things tend to wash up). The "Eastgate" businesses are mostly limited to a large area at Walton and Texas Avenue (though a few exist tucked in the back). 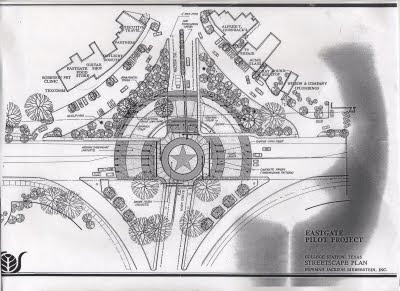 This was a proposal we got in the early 1990s, where Walton comes into Texas Avenue (originally, you couldn't turn left in or out of Walton--those parking lots were long yield lanes). Unfortunately, this never happened, and all we got was some abstract art and a new stoplight. But look at those businesses...a convenience store, only two familiar faces (Alfred T. Hornback's and Acme Glass), and no Layne's. Based on the placement of Eastgate Food Store, I'd put that at early 1990s or late 1980s. Starting down the list, we have 101 Walton-103 Walton. 103 Walton was Robinson Pet Clinic in 1989 (but 103A, the space seems small enough so that there's no B...103 must be on the right). 101 was presumably Texcomm. Both are vacant these days. Valley Cycling (a 1990s business) was what I remember being in the "main" section of Eastgate at 107 Eastgate. This I do have a picture but it's only postage-stamp sized, and it's on my computer but I'm not going to dig it out right now. , as you may know, was where Textbook Solutions is now. Later, it became a vintage clothing/nostalgia-type store ("Left-Handed Monkey", which lasted...not very long. Blissful Wishes Bridal was here for a while, but eventually by the late 2000s, it was Textbook Solutions, which it remains today. 109 Walton wasn't always food related ("Wing Zone" being here in the early part of the 2000s, records indicate), and it's also where the "Guitar Shop" was in the diagram. Regardless, this is where Leaning Tower Pizza was here at 109 Walton for several years (Partners Food Delivery was here for several years prior apparently, back in the 1990s--but the tenant space for this one is largely drawing a blank). Primo Pizza & Rolls took over when Leaning Tower fell down in spring of 2013. Leaning Tower was an interesting place--it made a particularly greasy pie with a unique cheese mixture. It was also pretty grimy (that's why the pizza is piping hot). It had some garden furniture for an "eat-in" area and had "free delivery" that had a significant discount if you picked it up in store, which means it wasn't actually free at all. Primo Pizza, a Charles Stover concept, initially planned to reopen the restaurant with a new name and theme and a similar recipe (the recipes were bought along with the store), but instead revamped the recipes and made a more upscale carryout pizza that had pesto on every slice (this opened in late summer 2013). For whatever reason, Primo shut down in February 2014 due to underperformance, but the way it was worded indicated that the closure could be temporary. After all, the sign remained up! The pictures I took in May 2014 revealed the restaurant was gutted. Gutted PP, May 2014. This is where the counter and menu were. The kitchen was behind that wall. This configuration was intact for both LTP and PP&R. So why did Primo close? Now, I don't know the reason why, but like with Sully's I can make a few guesses. There's always a chance that Primo Pizza will reopen since Charles Stover still has the recipes and name, but it definitely won't be Eastgate. 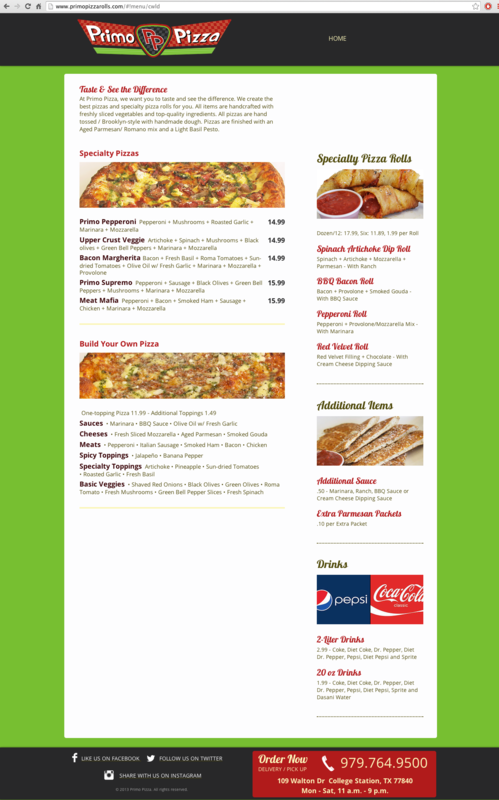 Here's Primo Pizza's webpage, archived in PNG form. Further down the line we have Eastgate Hair Shop for Men, I'm pretty sure this hasn't been updated in years (111 Walton) and Oasis Pipes & Tobacco, which moved here from a spot on University evicted for the Plaza Hotel redevelopment and was reduced to rubble soon before the Plaza Hotel came down. The business (and the sign) transplanted to here, 113 Walton, but didn't last long either. There appeared to be some baking equipment scattered in the building. This may have been a holdover from Partners Food Delivery. 119 Walton is called "To The Point" now and the older spot of Textbook Solutions. 123 Walton (no 121 Walton, apparently) is now "Aggieland Apartment Finders", and way in the back behind the strip mall area tucked away is Lost Souls Fixies (it seems pretty sketchy in the areas behind the center). Over on the other side, we see Alfred T. Hornback's, May 2014. This popular bar (120 Walton Drive) was here for many years, and although not built as it, had a large floor with pool tables and country music. Eastgate was not a huge draw like Northgate was and it closed permanently in summer 2011 though remained open for special events. After DC (Dixie Chicken, not DC Comics) moved out of the building that later contained Blackwater Draw Brewing Company. There's also a small professional office next to it, but I didn't read it too closely (nor is it particularly important to this narrative). More businesses, May 2014. Behind these is Crossfit 979. Acme Glass is a viable company that's been here for years, but The Event Company has been closed for a few years (wedding planners). The business at 118 Walton hasn't updated its website since July 2013. Acme Glass at 116 Walton does a good business, this one is pretty stable, the building next to it appears to be the old Greyhound station (114 Walton), but it seems vacant and used for storage (a visit in 2011 revealed a filthy but late 1990s era washing machine). I don't know when it went out of service, but it was a while ago. 108 Walton was Wilson Plumbing, but now is the home of Layne's. Layne's, May 2014. The former Sully's is in the background (check that out here). For what it's worth, Layne's opened before the first Raising Cane's (in 1994 vs. Cane's 1996). Behind these businesses is Eastgate Park, a place in four segments: it's the medians between the parking lot and Walton, and about four or so vacant lots on Foster. However, city records show that this has been parkland since the late 1930s. Abstract art was installed in 2000. Of course, that's just the tip of the iceberg, I could also go into the story of Munson Drive, which you could find and read about on MyBCS but since I read a scrapbook of articles, when Munson expanded to Lincoln in the late 1990s, the residents of Munson got the city to put up gates to prevent people from cutting through their neighborhood, which upset everyone else but it took nearly a year of fighting and countless letters to the editor before the city voted to remove the gates (and because at the time, Munson was where all the well-off and politically powerful people were, giving them enormous influence in the city). Or Thomas Park, which had always been owned by the city (all 16 acres) since 1938, but it wasn't until the 1970s when it began to become an actual park. The flagship of this was Thomas Park, which wasn't developed until the late 1970s. According to the great but dated College Station 1938-1988, it mentioned one of its accessories being a "plastic bubble dome which allowed indoor swimming during the winter months." Either this plastic bubble was impractical and/or fear of lawsuits from people asphyxiating in chlorine gas meant that it would be never be seen again, because I know that Thomas Pool is definitely never open in the winter months to my memory. But such a thing did happen, and you can see some B&W pictures here and here which I originally scanned for Project HOLD.